The following U.S. military intelligence report on the German 105-mm howitzer was published in Tactical and Technical Trends, No. 9, Oct. 8, 1942. This howitzer is a standard German light field-artillery weapon and compares favorably with the U.S. 105-mm howitzer (see Tactical and Technical Trends, No. 6, p. 12 for tactical employment). 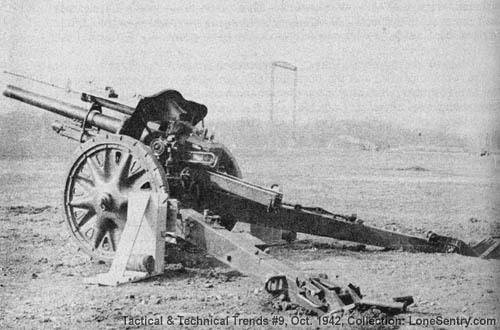 This howitzer, marked by a long barrel and split trail, and by the counter-recoil cylinder mounted above the tube, is so constructed that it can be fired either as a gun or a howitzer. Its semifixed ammunition and maximum elevation of 47° give it the characteristics of a howitzer. The long barrel allows high muzzle velocity, and the long split trail gives stability when the weapon is fired as a gun. The performance of the howitzer is limited by the use of the zone 5 charge as the standard charge instead of the zone 6 charge. The muzzle velocity is thus reduced from 1,542 feet per second to a standard of 1,283 feet per second, and the maximum range is reduced from 11,674 yards to a standard of 10,007 yards. The performance of the howitzer has also been limited by using separate loading ammunition. This has lowered the maximum rate of fire of the howitzer and thus reduced its effectiveness. The breech mechanism is simply designed and can be completely disassembled. The firing mechanism can be operated only in the fully opened or fully closed positions, and a manna1ly-operated safety lock is provided as an additional safety device. The breech mechanism is very heavy, weighing 109 pounds. The recoil and recuperator system is of the hydropneumatic type. The top carriage is principally of welded design and made of sheet steel 0.3 centimeters thick. The trunnion caps are of the split-bearing type. The elevating mechanism is completely enclosed except for the elevating arc and its pinion. The total elevating arc is 47 degrees and 37 minutes. The mechanism is designed to absorb the recoil and counter-recoil forces by permitting a movement of the worm and the worm wheel against Belleville springs. The traversing mechanism is of the screw-and-nut type and is almost completely enclosed. The total traversing arc is 56 degrees and 14 minutes, equal on both sides. The mechanism can be assembled as a complete unit before being assembled to the carriage. The howitzer can be emplaced for firing with a minimum number of operations, as it is automatically placed in three-point suspension for firing and the trails locked in position when the trails are opened. The bottom carriage is of complicated design and includes a larger number of parts than the U.S. design. The trails are of heavy riveted construction but move freely. After road tests, with the lower carriage splattered with mud and dust, the trails were opened without difficulty, but could not be closed. The trail lock (a spring-operated pin) functioned satisfactorily in locking the trails in the open position, but at times it was difficult to release the trail lock to close the trails. The optical fire-control equipment is very similar in its general features of design and construction to that used by the United States. The complete round is of the separate-loading type and consists of a propelling charge (in a case) and a fuzed projectile. (1) A cartridge case made of either steel or brass. (2) A primer of the same type and contour as the British 40-mm primer. The German primer is not renewable. (3) The propelling charge consists of five zones in cloth bags and a nitroglycerine powder which is not flashless. The powder used in the base zone is in the form of sheets, and in the other zones is in the form of small, square flakes. (4) A flash-reducer, consisting of approximately 0.9 ounces of spun lead wire, is attached on top of the base zone. (5) A cardboard closing-cover is supplied with a cloth lifting-handle. This cardboard is sealed in place and is very difficult to take off for removal of the zone charges. (1) A contoured, superquick, 0.25-second delay fuze. (2) A booster inserted in the top of the projectile. (4) A spotting charge consisting of a pellet of 3.7 ounces of red phosphorus. (5) A two-piece steel shell similar in contour to the U.S. 105-mm shell, M1. The rotating band of the shell consists of a single strip of copper bonded to a mild steel base and apparently rolled into place. (6) The design of the round greatly reduces its effectiveness, since only 3 pounds of high explosive are contained in the shell. The howitzer may be either tractor-or horse-drawn. In tractor-drawn units, a light tractor is used. When horse-drawn, the howitzer is pulled behind a limber of a six-horse team.